I’ve been thinking a little bit about my blog lately. Somehow, it’s not nearly as robust as I had envisioned. When I was journaling my reading and listening, I was a lot more creative and consistent about writing posts. Somehow, I’ve managed to strait-jacket my right-brain attributes and my blog has been absent a personable voice. While it is true that I launched this blog with the sole intention of posting audiobook reviews and, that while it is unreasonable to expect an audiobook review every day; there’s nothing to say that I can’t write about some of the other cultural influences that have informed me or, about other audiobook topics. Before iPhones with their “Notes” app, before goodreads.com and other social book groups that feature ways to catalogue your titles, before even my Word .doc scrapbook/journal of entries, there was The List. 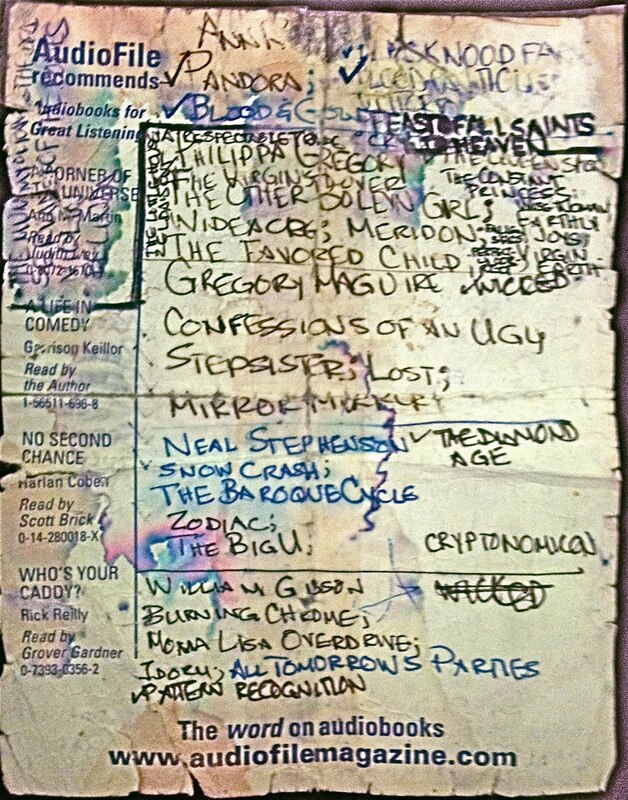 It was a slip of paper torn from an AudioFile Magazine notepad. It featured the titles of books I wanted to read, hastily scrawled and, folded into the coin section of my wallet. I created the list so that when I walked into a bookstore, I would not be overcome by plentitude – like a Soviet Russian in an American grocery store – and forget what I came in for. I would have direction, a purpose that would guide me through my exploration of the retail and library stacks. It served as a compass, allowing me to browse; but not quite so aimlessly! 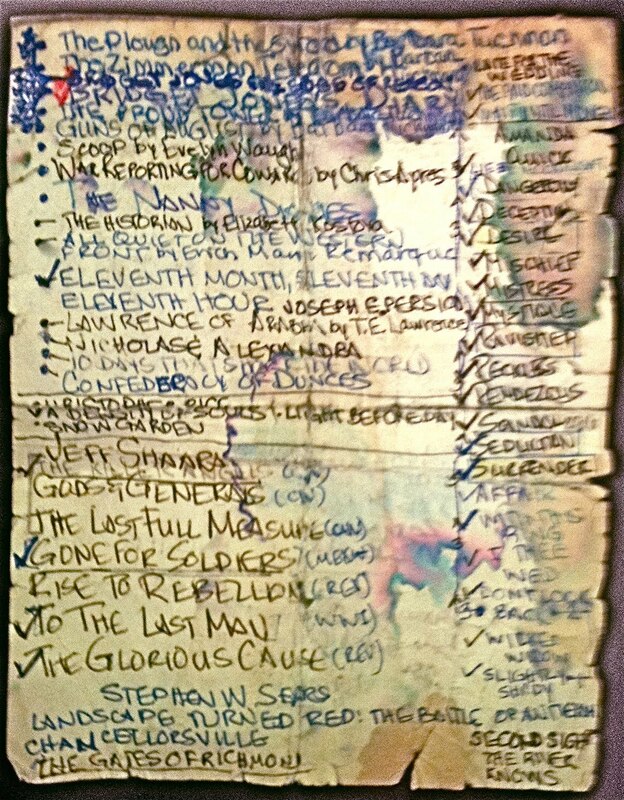 I recently unearthed The List, in all its tattered glory during a home office excavation. I couldn’t believe it was still around! And you, how did you track your reading in the 20th century? 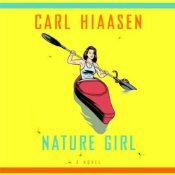 In Nature Girl, Hiaasen delivers, as expected, an offbeat cast of characters, including Honey Santana, a single mom who designs an elaborate payback for a telemarketer who not only calls her during her dinner hour, but who also calls her an offensive name. The vendetta serves as the main story line to which a number of farcical sub-plots become entangled – all threads coming to a denouement on the appropriately named Dismal Key in the Everglades. But for all the experience Hiaasen has had in developing the funnily unconventional plots and casts of characters playing out their dramas in the Sunshine State, Nature Girl falls flat. The kookiness has become something of a Hiaasenian trope. Because comedy requires a straight man or at least a straight context with which to be most effective, the comic aspects of Nature Girl are all too familiar and, as a result Nature Girl just isn’t funny enough. When everything is depicted as absurd, nothing is. Lee Adams delivered the material in a clean, clear, even pace. Her delineation of characters was well done, especially the role of Louis Piejack, a walking, rotting corpse of a man (both physically and morally) who stalks Honey. However, the novel seemed a bit overlong, never a good thing if the title is supposed to be light and breezy, which indicates that a faster pace and a better sense of comic timing is called for than what was delivered. Other Stuff: I borrowed a library CD edition of this title from a public lending library. This book qualifies for the Where Are You Reading? Challenge hosted by Sheila at her blog, Book Journey. Nature Girl is set near Everglades City in Florida.